The District of Columbia police force is vowing to keep Unite the Right 2 protesters and Antifa counter-protesters apart this weekend. The rival rallies on Sunday night at Lafayette Park across from the White House mark the first anniversary of the original Unite the Right rally in Charlottesville, Virginia, last summer. The National Park Service has issued a permit to Jason Kessler, organizer for the Unite the Right 2, to gather from 5:30 to 7:30 p.m. on Sunday at Lafayette Park across from the White House, and WUSA9 is reporting that Act Now to Stop War and End Racism (A.N.S.W.E.R.) has also been issued a permit for Sunday evening at the same park. 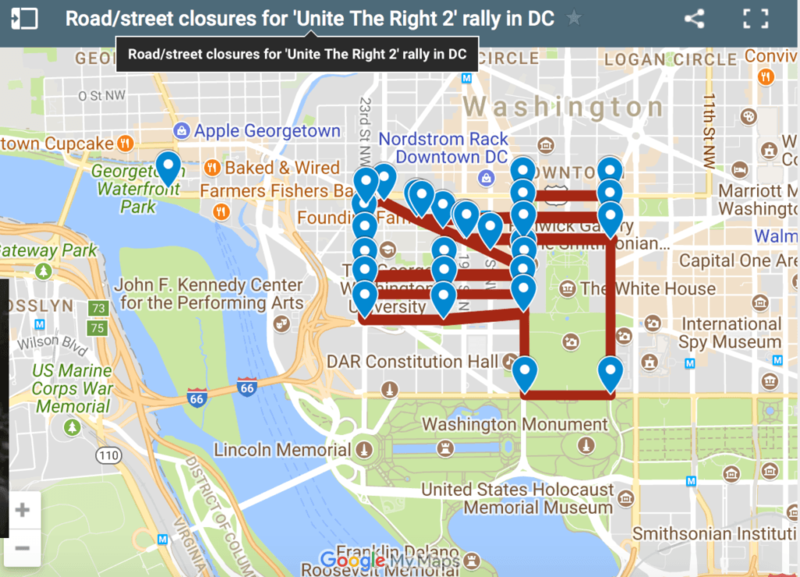 As Breitbart News reported, an Antifa website, shutitdowndc.org, states that hundreds of people will gather at Freedom Plaza starting on Friday, with counter-protests and workshops planned during a three-day period to promote open borders, abolishing ICE, and closing prisons. “Our number one goal is to keep them separated,” D.C. Police Chief Peter Newsham said in the WUSA9 report. D.C. Mayor Muriel Bowser has announced that the district’s Emergency Operations Center has been activated, which allows law enforcement to deploy all resources necessary to maintain order and public safety. “Whether they are spewing hatred or racism online or on the nation’s capital, let us speak in one voice, they are wrong,” Bowser said in the WUSA report. During last year’s protest, organized due to the proposed removal of Confederate monuments from Charlottesville parks, Antifa and right-wing groups violently clashed. A rally-goer was allegedly murdered by a protester in downtown Charlottesville after the police dispersed the crowd at the original rally. A police helicopter also crashed outside the town after monitoring the scene from the air. Two officers were killed.